Shop Handmade UK: 1000 Designers Milestone Reached! I've just updated the directory with 21 new designers / makers and I'm thrilled to say that this takes the total designers listed on Shop Handmade UK to over 1000. 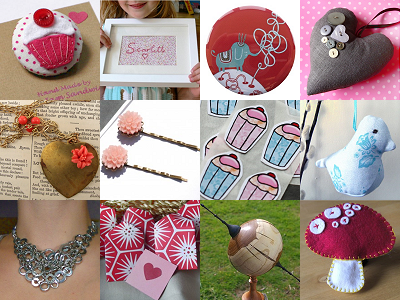 When I started Shop Handmade UK in December 2008 there was 520 listed so that's some growth. More importantly that's many great stores with lots of fabulous products on offer by talented Brits. This does mean the site needs a little makeover and the directory needs to be split and reorganised to help buyers find what they are looking for. Over the next few weeks I will be making some category suggestions so please comment. Thank you for adding my little red mushroom fridge magnet to your picture mosaic.